I can operate on around 6 hrs of sleep.....Cause im awesome. it should be a 3d one. but the it would have bad graphics cause it takes a LOOOOOOOOOOOOOOOOOOOOOOOOOOOOOOOOOOOOOOOOOOOOOOOONG time to do that good. My one wish is that they don't screw up Boba' personality and/or backstory, or even his future story...heck, I just wish they don't screw up. Period. I dont care what style of filming they do , so long as Fett stays true to his canon portrayal. However, it doesnt seem to take much for Lucas to decide to "alter" some things about certain characters recently, making a change to Boba not too unexpected. But hey, there's nothing wrong with looking to the bright side (ie. the producers NOT messing Fett up). Let's hope he doesn't ignore all material we have read from the books and totally mess about with continuity. Yes, that would be pretty bad. And as the TV show would probably be considered canon, there would have to be a lot of ret-cons. Well, that dooms us then. Cause there's no way he'd pay attention to continuity. 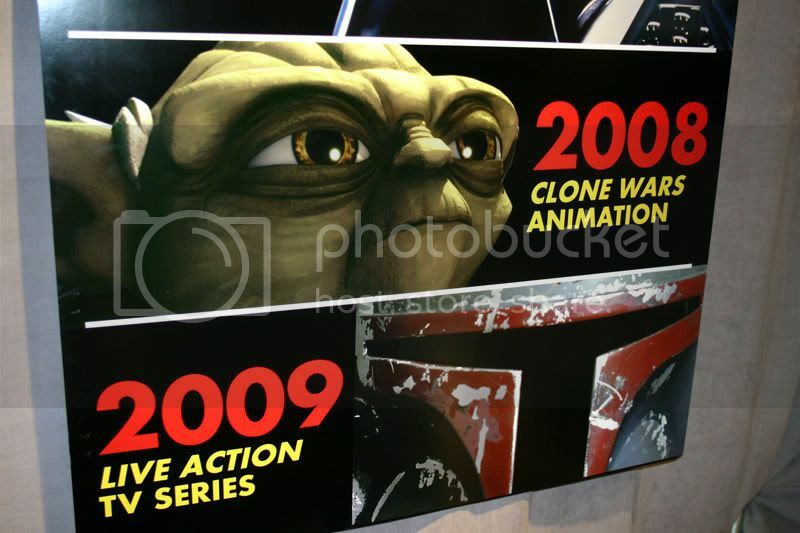 For example, look at the Clone Wars cartoons. There are so many non-canon things in there and yet it is sadly considered canon while the true canon goes unnoticed. Just cause tv's more popular and people are more likely to have watched some stupid show than to have actually picked up a book and read it. actually, since Clone Wars is being entirely re-done, the old show is kaput now. Surprised this hasn't been mentioned, but Rick McCallum confirmed Boba Fett is in the Star Wars TV series in the Star Wars Insider. Not a surprise to us here, but it's another confirmation from the source. I think I've said before that McCallum is not to be trusted, as he's "confirmed" numerous other things in the past that had no truth whatsoever. Not denying it, just wondering but...such as? He also officially confirmed we would learn Yoda's species in ROTS. And also that Boba would be in ROTS. Those are all I can remember off the top of my head. There was an interview thingie with him but where there's more, but that's Hyperspace members only at sw.com and I let my subscription run out so I can't go look anymore. @Miba: Did he announce those claims in SW: Insider too, or where those just internet claims? Because anyone can claim he said something over the internet, anyone can easily forge an interview, ya know? Yes, he said that in Insider. If I took a while of looking I could find which issues, but I'm a bit busy right now. I finally found an image of the poster everyone was talking about last year at Toy Fair that started the speculation of Fett being in the new TV series. Not a grandiose as I thought it'd be, but still pretty neat. Enjoy. Isn't that the poster that is on the front page of this topic? If that poster lied to me about Boba in the SW TV, I'm going to hunt it down and gut it like a fish..........Only the poster. Indeed it is. I usually check the posts from the most recently posted to the first. Never made it back that far on this one. Thanks, dude. Never saw the entire poster before. Pretty cool.